Pajama Press is honoured to celebrate a win for the Geoffrey Bilson Award for Historical Fiction for Young People for the second year in a row. 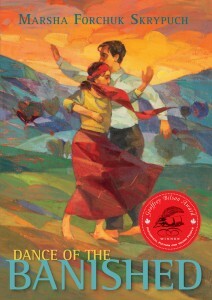 Dance of the Banished by Marsha Forchuk Skrypuch received the award on November 18th at the Canadian Children’s Literature Awards Gala at the Carlu in Toronto. “In Canada we are writing fantastic historical fiction for kids,” Skrypuch said, speaking in particular to her fellow finalists Patrick Bowman (Arrow Through the Axes, Ronsdale Press) and Caroline Pignat (The Gospel Truth, Red Deer Press and Unspeakable, Razorbill Canada). This is not the first award for Skrypuch, who has written more than a dozen historical picture books, chapter books, and juvenile and young adult novels. In these books. as in Dance of the Banished, Skrypuch employed her exceptional research skills to bring to light aspects of history that are little known or understood. A second Pajama Press title was also a finalist for an award at the gala. A Brush Full of Colour: The World of Ted Harrison was shortlisted for the TD Canadian Children’s Literature Award for the most distinguished English-language Canadian children’s book of the year. This picture book biography, co-written by Margriet Ruurs and Katherine Gibson and illustrated with Ted Harrison’s own art, details the artist’s life from his childhood in an English coal mining town to his final home in British Columbia. It recently won the Children’s Literature Roundtables of Canada Information Book Award and is nominated for several more, including the Forest of Reading Silver Birch Non-Fiction Award. A Brush Full of Colour is published under the Ann Featherstone imprint. Pajama Press extends warm congratulations to our talented authors, and appreciation to the TD Bank Group and the Canadian Children’s Book Centre for their administration of these awards. Marsha Forchuk Skrypuch, a Canadian author of books for children and teens, will also be marking the anniversary. Skrypuch is no stranger to controversial history; her picture book Enough, written about the holodomor, earned her both death threats from angry readers and a medal from the President of Ukraine: the Order of Princess Olha. She has gone on to write over twenty other books for young readers, including her recent YA novel Dance of the Banished, which takes place during the Armenian Genocide. Skrypuch’s week is filled with events commemorating the genocide’s anniversary, but she took some time to speak with us about Dance of the Banished and why she writes books for young people about difficult subjects. Zeynep’s portion of the story takes place in a tumultuous time and place: the Ottoman Empire during the Young Turk revolution and the Armenian Genocide. What challenges did you face in your research for Zeynep’s perspective? I rely heavily on first person accounts to build scenes and timelines in my novels. The problem while writing Dance of the Banished was that I could find no first person account from the perspective of an Alevi Kurd, even though thousands of Alevi Kurds witnessed the Genocide and their rescue operations are well-documented in other first person accounts. The trick was to wade through first person accounts of missionaries, Genocide survivors and others and piece together what Zeynep’s life would have been like during WWI and the Armenian Genocide. I also had to read up on Alevi beliefs. After I finished writing the novel, I sent it to Suleyman Goven, who is of Alevi Kurd heritage. He gave me detailed feedback to make Zeynep more authentic. This is not the first time you have written about controversial historical events. What draws you to tell the stories that some would rather see forgotten? I feel a responsibility to give a voice to people whose experiences have been silenced for political or religious reasons. I need to be passionate about my subject because otherwise I’d get bored with my own words. Writing these untold bits of history is my way of honouring the survivors. Why do you think it is important for books on these subjects to be directed at children and young adults? If I had written this book for adults I would have had to pad it with fluff and I don’t like writing fluff. I wanted to write a short but powerful and historically accurate novel. That by definition is a young adult novel. 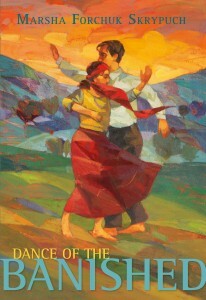 The experiences of Ali in Dance of the Banished were based on actual events that took place in Canada during World War I, but that were forgotten for nearly a century. How did you come across the story? Ali is interned by Canada in WWI. I knew about this incident for quite some time as my own grandfather had been interned. What I didn’t know was that 100 men who had emigrated from the Ottoman Empire and lived in Brantford had been interned. That information was brought to me by two Brantford historians. Figuring out who these men were became a journey in itself. 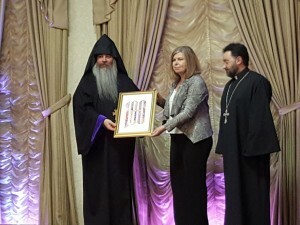 This year has been a time of commemoration both for the Armenian Genocide and the internment of so-called enemy aliens in Canada during World War I. You have been involved in events and speaking engagements for both. Have you had any particularly memorable experiences? The local commemoration of the centenary of WWI internment took place on August 22, which was a Friday, and we began it at 11am. Despite it being held right before a long weekend and in the middle of a work day, the church hall was packed. Most people interned had been Ukrainian, but people from all different backgrounds came out. One woman who came out was Sharon Gashgarian, who was of Ukrainian heritage but had married an Armenian. She was blown away by the cover art on Dance of the Banished and contacted me later, asking permission to create a fabric art work based on the cover art. I contacted Pascal Milelli, the artist commissioned to create a painting for the cover, and he was fine with Sharon’s request. I bought the original, and showed it to Sharon. Tonight (April 21) I did a reading at the Brantford Public Library to commemorate the Armenian Genocide. This was part of a worldwide reading event to pay tribute to the many writers who have been killed for speaking out about the Genocide. Sharon attended, and she brought her fabric art. I brought Pascal’s original and we have both of them up on easels, covered with Ukrainian shawls. We revealed them both to the audience and Sharon presented me with her art work. It is breathtaking. For the rest of the month, Sharon’s fabric art will be hanging in the front window of the Brantford Public Library, surrounded by my books and other books about the Armenian Genocide. Click here to download this interview in PDF format.